Got Tiggy's results back and though quite frustrating in some ways it's good in others! The results are pretty much clear and normal for everything. They didn't do any additional testing specifically for kidney function as they thought these results didn't give enough indication there was a problem. Since the specific gravity was bang on in the middle of the range they said the kidney is functioning normally in concentrating the urine. There are no white or red cells or bacteria present, nothing for any of the 'globins', nitrates etc and nothing even to consider regarding protein. The only thing that did come up was a minor trace of blood which they said was 'physical' and possibly caused by some calcium carbonate crystals they found. They don't believe diet will have any effect on these. The lab did say the only thing to cancel out these crystals is potassium citrate (Cymalon) but said caution should be used with this due to the effects of potassium on the heart. There are also concerns over its use related to kidney function. I have given Tigs some of this in the last few weeks and it did seem to help but hasn't cleared it completely though I'm now concerned about its use at all. I was concerned with its use in Chilli as it says on the pack about using with ACE inhibitors of which Fortekor is one. Maybe I have to just make sure Tiggy gets enough fluids to help flush everything out and make sure she moves about so it doesn't sit in her bladder causing irritation. She has lost 50g in weight in the last 10 days too and she is losing hair as the fleece and pet beds show lots of loose hair everywhere. Yes, encouraging but nothing that really helps you get to the bottom of this. By the way, I always thought the specific gravity of urine measurement was shady. It seems to me if you drink lots and lots of water, it is going to show that the urine is mostly water and perhaps mislead someone into thinking the kidneys are not working properly. I could certainly be wrong (no veterinary background). I agree on the SG, from what I can find out too, you really need to do several tests over a period of time, giving water and withholding water for a short while. If the kidneys are functioning correctly they should make the urine more dilute or concentrated accordingly. The main question mark is whether we take guinea pigs to be based on the dog range of readings (more usual) or human readings that have more accurate test results done on them. Or are guinea pigs totally different? Normal dogs and cats is a MINIMUM of 1.030. Normal human values are between 1.003 and 1.035 (g·cm&#8722;3) but usually between 1.020 to 1.028 (or 1.010 to 1.035 g/ml depending on source). A fixed low specific gravity is an indication of chronic renal disease. If fluid intake is stopped for 24 hours, a normal (human) kidney will secrete urine with a specific gravity of at least 1.025. One vet said 1.012 - 1.018 would be more of a range for a pig in kidney failure, which makes sense given the info above. Note: Normal value ranges may also vary slightly among different laboratories. So, are we any wiser about Tiggy's result being 'bang in the middle'?! I need to see if they have an actual figure as given for Chilli. Well, haven't really felt the need to update here in a while even though Tiggy has been prone to getting blood in her urine on occasion, a dose of Baytril and much probiotics usually fixed it. The last episode was quite hard on Tiggy however, it took about 3 weeks of Baytril to fix and she needed much probiotics and something to get her bowels moving again. Some months later we are down this road again but this time it may be the last. Oh no! I hope Tiggy's problems can be sorted out and she'll be ok again! X-ray shows Tiggy has bladder stones. One quite big but not passable or flushable. Vet not willing to operate but says if it was in the next day or two before she goes too downhill, there's a chance for her. Tiggy has an appointment with Thistle Cavies good vet tomorrow to see what he says. I know everything is stacked against her but I think I owe her one last chance, the alternative is to have her PTS this week, it's not fair to keep her going the way she is. She's a fighter but been through so much already. Your a good mom. You'll do what's best for Tiggy no matter how hard it is. Good wishes here. I know Tiggy is a special guinea pig. I hate to hear Tiggy is doing poorly. I'll be thinking of her. Sending good thoughts for you and Tiggy. She is a wonderful, special girl. I'm thinking of you both. Poor Tiggy. She's such a special girl. Hugs. 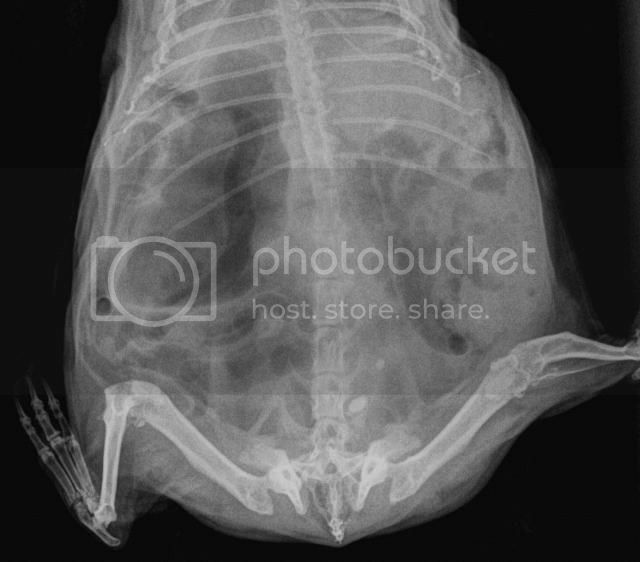 Tiggy's X-ray of her bladder stones is below. There are 3 visible you can see next to the spine. We went down and saw the TC vet who was a lovely guy and confirmed what my vet said and had a look at the X-rays. We also got a pee sample and did a urine test with the dipsticks that unfortunately showed ketones were showing and also bilirubin. After further examination the vet thought that there was something else going on with her liver and it felt enlarged or there was a mass near or on it. My vet also thought there was something else going on in there so this really confirmed it. With this in mind and the fact Tiggy was looking pretty disinterested in things by now, the decision was made to have her put to sleep. It wouldn't have been fair to put her through another car journey or for her to go on any longer, she wasn't going to get better and unlikely to pull though an operation. Oh my goodness, I'm so very sorry. Tiggy was such an amazing pig-girl. I have no doubt that she knew how much you loved and adored her. Big hugs. Webs, you have all my sympathy. She was indeed a wonderful guinea pig. She had been through so much with you. I know you will miss her. Tiggy was adorable, and I always enjoyed seeing her photos and reading her adventures.